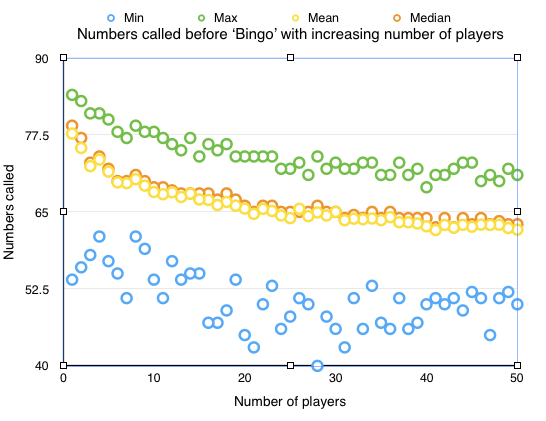 Before I begin, I did a search through math.stackexchange and came across two previous attempts to get people to solve probability problems involving bingo. Neither produced a response. So what makes me think I'll be any luckier? Maybe some new guy/gal has some insight. The game of bingo is played with a bingo card having 25 squares, arranged in 5 columns of 5 squares. The first column has numbers between 1-15, the 2nd column has numbers between 16-30, and so on (the 5th column (!) has numbers between 61-75). Someone randomly draws a number from 1-75 and announces it. To make things a little interesting, the middle square is labeled "free". If a number called matches one on your card, you mark it. The goal is to have a complete row, column, or diagonal of 5 marked off first. Here's my question: what is the expected number of random draws when there is a winner among $N$ players? I was thinking about this because I got involved in such a game this evening with my kids, and it seemed to take an awfully long time for a winner to surface. My thoughts: this seems to me to be an extremely tough problem. I consider myself better than average in computing expected values, yet I found myself completely stuck on even how to approach the problem. I suppose I could have searched the literature, but I figured I needed to pose a decent question here; I owe it to the users who have posed so many interesting questions here for me to answer. I'll look for any insight that might move the discussion forward; I do not expect a complete answer for you to post. As evidenced by some of my previous answers, I like to write quick numerical simulations if they seem feasible. Bingo seems especially easy (Python code below). I'm not sure if this is true, but I think the Bingo cards are essentially independent of each other. 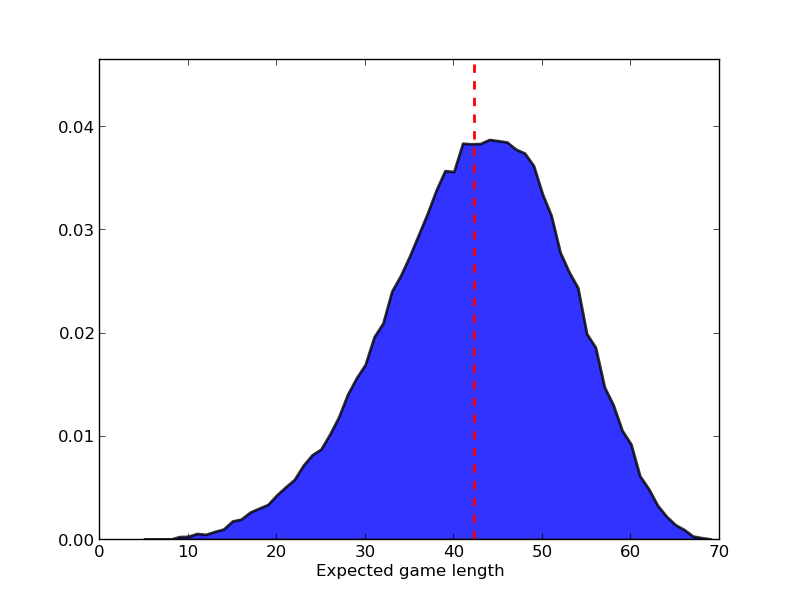 That is, if we can compute the probability distribution of a single player $N=1$ game length, we can use that to compute the joint probabilities for any number of players. Thank you for both question and answer. In the mid 1980s, I spent a lot of time simulating distributions with FORTAN and IMSL. A few days ago, I had a few hours playing bingo - not the American game described by Ron, but the UK version which has (in the version I played) digits 1-90 arranged in 6 'games' on a page - 15 digits in each 'game' - arranged in 3 rows of 9 (including blanks). All 90 digits were used and each of the 6 games on the page was unique but not independent. About 50 players in the room, each had one sheet with 6 games. Each player's page was unique and probably independent. Randomised numbers were called until one player had all 15 in one of his/her 6 games. Over the afternoon the process was repeated about 14 times - each time with new sheets. (Sheets had been bound into little booklets.) Over the afternoon, we noticed that the number of digits called before bingo was high 60s. What was the actual distribution? I'm trying to get my head around python decided to simulated the bingo game. I found this site https://github.com/gvenkat/bingocards that showed me how to generate the bingo cards being used. I added to that code a couple of loops to generate the simulation. First generate random numbers to be called. Then, step through the nums1_90 list and set any matching digits in clayout to zero. Exit (with counter) if the sum of any sublist is zero. Run the simulation 100,000 times. This represents 1 player playing 100,000 games The pdf is skewed (similar to Hooked above) and looks a bit poisson. What happens for different numbers of players? I ran the simulation 100 times for increasing numbers of players from 1-50. Min, mean, median, max for increasing numbers of players are shown below. The pdf maintains its shape and shifts rapidly from a centre of high 70s, and then steadily down to a centre of mid 60s. The maximum sample value is constrained by the short tail on that side but the minimum sample value shows a high variability because of the long tail. Not the answer you're looking for? Browse other questions tagged probability recreational-mathematics or ask your own question. Probability of getting a bingo pattern with a certain number of balls drawn? A bag has n cards labeled from 1 to n and a person has the option to play 2 two games, either Game A or Game B. What are the odds that no bingo number will be called in sequence? 2 player card game involving matching ranks, who is more likely to win? Do the 12 lines of a bingo card have equal chance of winning?